Ever smell a skunk while driving down the highway? It’s not exactly a pleasant aroma, is it? 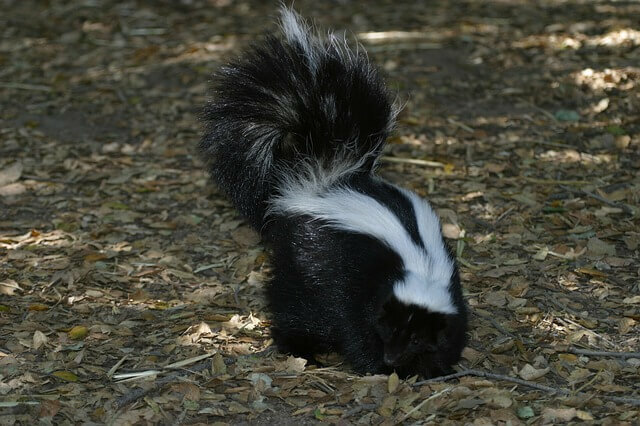 The skunk is just another wild animal and a pest that lives right under our noses (pun intended) under sheds, decks, steps, and even near urban buildings. The substance skunks spray is extremely potent and hard to remove, whether it’s from dogs, clothes, inside/outside houses, etc. Females give birth to litters of typically 3-5 kits every year around April-May. Skunks are quite low on the “fun-to-deal-with” list. That odour defence mechanism can take weeks to eliminate! Solving a skunk problem, whether there are one or seven, is done humanely. And yes, we get up close and personal with skunks all the time. If you don’t like the sound of that, call Pest Boss any time!